The kitchen is often the heart of the home. It’s the room where people gather to eat, converse, and enjoy each other’s company. It’s where you prepare delicious holiday meals and catch up with an old friend over a cup of coffee. It may also be where your kids do their homework, sitting at the kitchen island while you prepare dinner for that evening. At Lighting One®, we want every customer to have access to the finest in kitchen lighting. You likely spent a lot of time researching the best appliances, countertops, and more for your kitchen, so why not do the same for your lighting? If you’re building a house, or you want to renovate your kitchen so that it reflects your tastes, then one of our member showrooms can help you find the perfect fixtures. With locations across the USA and Canada, you can find a Lighting One affiliated showroom that can help you design, choose, and build your new lighting layout. Many homeowners have an idea of where they’d like to begin on their kitchen lighting. They may have seen a modern pendant light or an under cabinet fixture in a magazine or online, and the shape or color of the fixture inspired the rest of their lighting design. Others are less sure about what they want, but they can envision the completed kitchen in their mind, and they see themselves and their family using the space for years to come. Regardless of which one you are – the detailed planner or the person who is open to suggestions – we can help you find the right kitchen lighting choices. It doesn’t matter if you’re designing a small cottage kitchen or a grand galley for your vacation home – our stores have the selection you need and the expertise you can trust. Many of our member showrooms have in-house lighting experts who can sit down with you and go over fixture styles that fit your vision. They can also provide design advice and guidance for those areas where you’re not so sure. Above all, we want you to have a positive experience to give you confidence so when you need lighting in the future, you’ll know where to turn. If you’re ready to design or build your new kitchen, find a Lighting One member showroom near you today. We’re dedicated to helping every customer discover beautiful lighting options that fit their personal tastes, their budgets, and most importantly, their homes. When designing your new kitchen, you likely start with the countertops and appliances. This often makes the most sense, but how will the countertops and appliances look under poor or inadequate lighting? At Lighting One showrooms, we are equipped to help you find the ideal fixtures for every area of your kitchen. The ambient lighting’s purpose is to provide illumination for the entire kitchen. This can come from a hanging light in the center of the room, or, if the room is larger, multiple ceiling fixtures placed evenly throughout the space. There are pendants and small chandeliers that can function as the room’s ambient fixture, and you’ll want to be sure that the light is bright enough to reach every corner of the space. After all, the kitchen is where you prep, cook, and clean on a daily basis, and even entertain at certain times! A great addition to your kitchen’s ambient illumination can be recessed lighting, and spacing these fixtures throughout the room can give you a brighter room that’s more functional and inviting. If your kitchen has a ceiling that’s taller than 10 or 11 feet, then recessed fixtures are a must. There may not be much to highlight or accent in the kitchen in terms of decor and artwork, but that doesn’t mean you don’t need accent lighting. 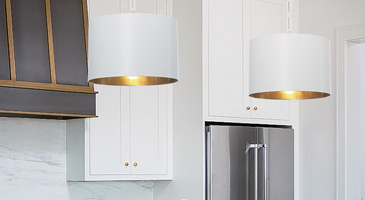 The pendant lights over your kitchen island can add a great touch through their shape and style, and the illumination they provide will accent the color and texture of your countertop. They of course also function as task lighting for doing homework, prepping meals, or serving snacks. When it comes to task lighting, this is perhaps the most important aspect of your kitchen lighting design. When you’re in the space, you’re likely chopping fruits and vegetables, washing dishes, or cooking something on the stovetop. You need light to see by as you do these tasks, and having the right under cabinet fixtures can make all the difference. Under cabinet lighting makes chopping and prepping easier, and having a focused recessed or hanging light above the sink makes washing dishes a breeze. As you move from one area to another through what is known as the “workflow triangle,” it’s important to have adequate lighting in each spot. The triangle follows the lines from the fridge to the stove to sink, and it’s imperative that each area have the lighting you need. Whether it’s the under cabinet lighting by the refrigerator, the recessed light above the sink, or the lights from your vent hood above the stove, every area needs adequate lighting to make it as functional and as efficient as possible. At Lighting One, our member showrooms can help you design and build your new kitchen. Whether you’re starting from scratch as you build a new house, or you’re renovating your kitchen so that it has the features you’ve always wanted, you can find the right fixtures in one of our member showrooms. 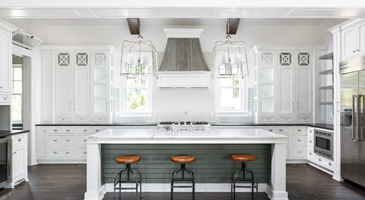 Visit our Inspiration Gallery today to see some great examples of kitchen lighting. Hopefully you’ll be inspired to get started on your new design! When designing your new kitchen, it’s important not to forget about your lighting controls. Having the right switches and sensors can make life much easier for you and your family, and at Lighting One, we’re dedicated to helping families make the most of their kitchen lighting. Every one of our member showrooms can provide you with a plethora of switch options, as well as help you decide where best to install them! If your kitchen has multiple entrances or doorways, then it’s important to have switches at every location. You may have one doorway that leads from the dining room or living room into the kitchen, and one that leads to the back of the house or onto the backyard patio. Placing switches at each location will ensure that you can turn the lights on or off as you leave or enter the room. Many modern homes have an open floor plan, and the kitchen is integrated into the plan next to the dining room or living room. If you have a square pillar or a small wall that divides the space from the rest of the house, consider placing your switches on this surface. You may not want the switches to be easily seen, and an in-house lighting expert can help you find the best spot for your controls. Since you have several light fixtures in your kitchen – the ceiling light, the pendants, the under cabinet lights, and the recessed lighting – you’ll likely need a switch for each one. The switches for the ceiling light and the pendants can be on the wall or the pillar, along with the switch for the recessed lights. Having multiple switches allows you to control which lights are on and which ones are off, giving you the ability to keep some on for nighttime lighting or to create the perfect ambiance when you’re hosting friends and family. For lights such as the recessed fixture above the sink, it’s best to have the switch near the sink, since you’ll likely only use it when you’re washing dishes or cleaning up after dinner. You may not think that it’s necessary to have dimmer switches in the kitchen, but they can truly make the space more appealing. 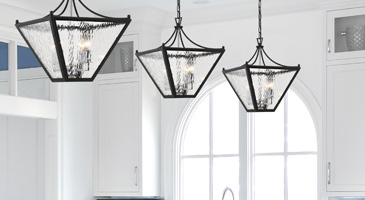 You may not want to have the kitchen island pendants as bright when you’re hosting a dinner or cocktail party, and lowering them can set the mood, while still giving people enough light to see by as they retrieve drinks and appetizers. Lowering the recessed lights can also improve the ambiance, especially if you have lights above your cabinets. This can create a warm glow around the entire room that can make the space more enticing. If you’re designing a new kitchen, then make sure lighting controls are high on your priority list. Once you’ve chosen your new fixtures, you’re going to need the proper switches and controls for them. Some of our member showrooms even have modern options such as smart controls and sensors that allow you to create and set a lighting theme for certain times of the day! If you’ve lived in your house for several years, then you may have grown tired of your kitchen light fixtures. The fixtures may not have been chosen by you, but by the previous owners, and you’ve just never gotten around to replacing them. At Lighting One, our member showrooms meet with customers all the time who are looking for a modern upgrade for their outdated kitchen lights. By replacing your lights during a remodel, or by updating the style before you sell your home, you can boost your enjoyment of the space, as well as the resale value of your property. One problem that older kitchens can suffer from is a lack of adequate ambient lighting. Either the main ceiling fixture doesn’t produce enough light, or there aren’t enough fixtures to illuminate the entire room. If you have an old flush or semi-flush mount in the middle of the room, consider replacing it with a decorative pendant light or small chandelier. With the advances in lighting technology, you can have brighter ambient light that is more efficient and that reaches more of the room. If you don’t have a kitchen island, but you’re planning to build one, then a new island fixture will be an addition rather than a replacement. This fixture is a feature that many homeowners want, and with the number of uses that your island has, it’s an important aspect of your kitchen. You can choose three separate fixtures that hang from the ceiling, or one fixture that has three lights in it. Why three? Many kitchen islands have standard dimensions that are ideal for three lights, and in terms of design, odd numbers are more intriguing than even numbers. If you’ve been thinking about updating and replacing your kitchen light fixtures, then find a Lighting One® showroom near you today. We have locations all across North America, and each store is equipped to help you find the perfect options. At Lighting One, we want to empower our member showrooms to be able to help every customer find the kitchen lighting they need. Our co-op program is designed to give store owners access to the products and resources they need to best serve each customer, as well as the ability to train their employees to understand which options will be best for a specific situation. By shopping locally with one of our showrooms, you’re supporting the local economy and keeping your hard-earned dollars in your community. Showroom owners also have access buying power, which means they can pass those savings on to you, the customer. Instead of shopping online or heading to the nearest big box store, you can find your products at an independent retailer who is dedicated to providing you with exceptional service and an amazing selection of fixtures. Through this independence, owners are able to set up their stores how they feel is best, which provides every customer with the unique experience that they’re seeking as they search for new kitchen lighting. If you’d like to learn more about our cooperative program or our membership benefits, then we’ll be more than happy to answer your questions. You can contact us by using the form below, and a member of our team will respond as soon as possible.